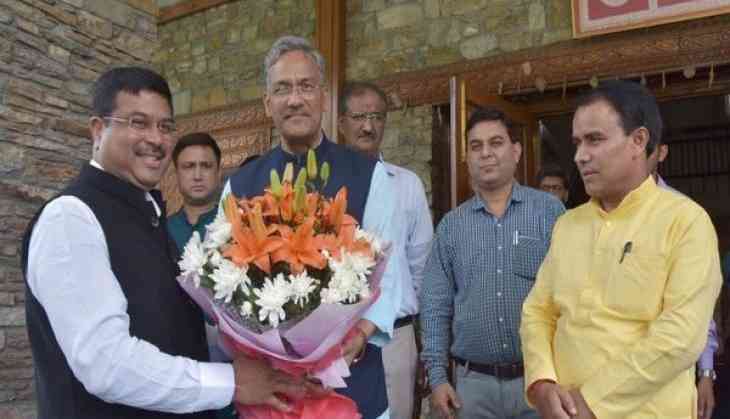 Union Petroleum and Natural Gas Minister Dharmendra Pradhan along with Uttarakhand Chief Minister Trivendra Singh Rawat on Sunday reviewed the status of various skill initiatives in the state and suggested measures to identify areas of improvement. Framework of Skill Ecosystem in Uttarakhand will be prepared in the next two months. Under this scheme, the state government with the help of Centre will train 40 lakh people aging between 15-59 to generate skills and employability. "There are 176 government ITIs in Uttarakhand which are much more in view of the area and population. Proper usage of these institutions should be ensured. Some tie-ups with industries should be done for these ITIs. The industries should not only upgrade these ITIs, but also give placements to students studying there. For the same, the Centre will provide full support to the state government," Pradhan said. Pradhan also shared his views on the "expansion of skill initiatives by identifying new and emerging trade and practices, and implementing demand specific skill training so that talent could be absorbed within the state". "This can provide a major help in controlling employment oriented migration," he said. Pradhan also took to Twitter and wrote: "Uttarakhand is amongst the best performing states in our Skill India mission. Suggested to identify areas of improvement and work towards re-skilling and upskilling of the entire workforce in the state. Also suggested to use technology to reach out to the last man for value addition." Speaking on the occasion, Chief Minister Rawat said: "In Uttarakhand, there are many potential jobs in the service sector. Special focus should be given on the service sector in the skill development plan."